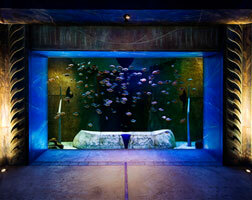 Welcome to a world of sunken aquatic chambers, submerged ruins and exhilarating water rides. 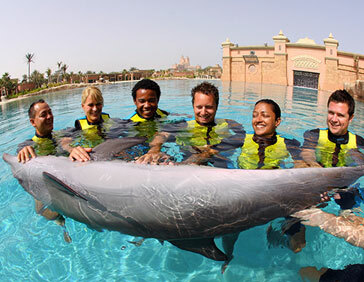 A place where shark experiences thrill and dolphin encounters leave lifelong impressions. 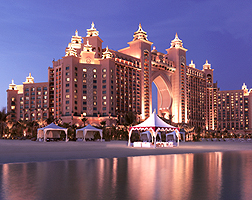 Enter into the magnificent world of Atlantis The Palm, Dubai with Netflights.com and experience exotic marine life combined with sumptuous guest rooms and suites, diverse restaurants and stylish boutiques to form the ultimate resort destination. 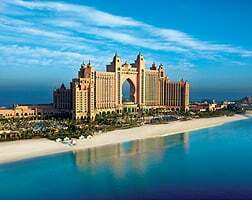 To see the best cheap holidays to Dubai in 2015, take a look at the Netflights.com cheap holidays offer page. Atlantis The Palm has a number of different room types, depending on whether you’re looking for a family hub or a large suite. All rooms have facilities including; air conditioning, hairdryer, television, Safe, Ipod docking station, iron and ironing board, mini-bar, tea and coffee facilities and a turndown service. Here’s our breakdown of the different rooms available. The Deluxe room: based on the first five floors of the Royal Towers, these rooms have either double queen sized or king sized beds, allowing a maximum of two adults and two children, OR three adults and one child per room. Each room has a view of either The Palm or the Arabian Gulf from a balcony. 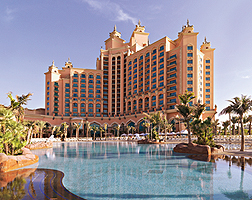 The Atlantis room: situated on the upper floors of the Royal Towers, these rooms include a balcony looking out over The Palm or the Arabian Gulf and can sleep a maximum of two adults and two children, OR three adults and one child. The Imperial Club room: Located on floors 11 – 15, these rooms have upgraded amenities and can sleep two adults and two children. Guests also receive admittance to the Imperial Club hospitality lounge, with sweeping views of the Arabian Gulf, The Palm Jumeirah and Aquaventure. The Regal suites: with a view of The Palm and accommodates a maximum of two adults and one child. The Regal suite offers an abundance of space including a private pantry, living and dining area, bathroom and master bedroom. 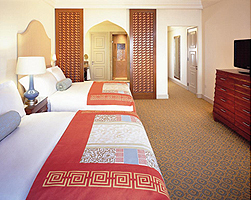 Situated on each side of the Royal Towers, the rooms have stunning décor and daily complimentary water is also included. The Terrace Suites: Sleeps two adults and one child, or three adults. The Terrace Suites are situated in the centre of each tower, offering a bedroom, living room and a large balcony on which to sunbathe or dine alfresco. The rooms are spacious and well decorated, and in room dining is available. The Executive Suites: with views of either the Arabian Gulf or the Palm, these suites perfectly house two adults and one child, or three adults. They comprise of a bedroom, living room and French balcony, as well as a large freestanding bath to soak in! The Bridge Super Suites: sleep a maximum of 6 adults and three children, the Bridge Super Suites are perfect for a group holiday. The suite spans the Royal Towers, which allows awe inspiring views of the Arabian Gulf and The Palm, as well as two terraces to relax on. Guests have a dedicated butler, a private elevator and a library with state-of-the-art media centre. Also included is a reception lounge, a dining area with a gold leaf table (which can seat 16 guests! ), and three bedrooms, all of which are en suite. The Royal Super Suites: located on the upper floors of both towers, each Royal Super Suite can sleep 4 adults and two children, or six adults. The master bedroom is fitted with his and hers en suites and a private living area, whilst the guest accommodation is also en suite and includes an open shower with water wall. A grand lobby, living area, dining room and sun terrace complete these suites. 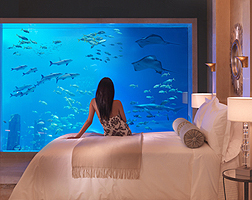 The Lost Chambers Super Suites: sleeping two adults and offers a view of the mesmerising Ambassadors Lagoon, these suites are exclusive to Atlantis. 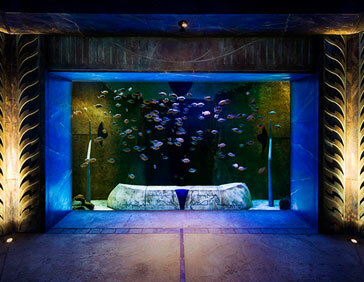 Each bedroom and bathroom show case the underwater views, creating accommodation unlike anywhere else in the world. Stretching over three floors, the two suites (Neptune and Poseidon) offer a grand foyer and a living / dining area, along with a dedicated 24 hour butler. The Presidential Super Suites: is comfortable for two adults and one child, or three adults. The Presidential Super Suite has a view of The Palm and features a master bedroom with his and hers en suites – as well as a hallway, bathroom, living area and separate work / dining room. An open stretch of balcony is perfect for relaxing or sunbathing, and a dedicated butler is available should you need him. Dining at Atlantis in Dubai can be charming, romantic, fast or fun, depending on where you chose to eat. One thing is guaranteed wherever you end up, you’re sure to enjoy fantastic fresh food, cooked by Dubai’s best chefs. Whether you’re looking for award winning cuisine from high profile chefs or just a snack by the pool, the Atlantis has a number of options. Platos: An ‘oriental tea lounge’ with an elegant style, Platos offers light breakfast items, afternoon teas and fine spirits in the evening. Kaleidoscope: A restaurant with a Mediterranean feel, Kaleidoscope offers the very best of North African, Mediterranean and Arabic cuisines, with the influences of Greece, Malta and the Levant region. Special offers include an Indian meal and drink for AED 185 (£32) per person, and an Arabian and Italian themed night. Saffron: A bold, contemporary restaurant which offers primarily Asian dishes, mainly cooked at the open cooking areas throughout the restaurant. The décor (designed by New York restaurant designer Adam Tihany) is stunning and the food and wines are exemplary. Special offers can include four adults dining for the price of three or a complimentary bottle of wine offered for a table of four adults dining together. Prices can start from AED 195 (£33) per person for special offers menus. The Shore: An outdoor bar and grill offering poolside service. Snacks are available, as well as margaritas, burritos, nachos and steaks. Shark Bites: A great place for families; this restaurant offers quick food which everyone will enjoy. Burgers, fried chicken and fries are all available. Splashers and Wavesa number of kiosks through Aquaventure which offer quick snacks whilst you’re exploring the waterpark. 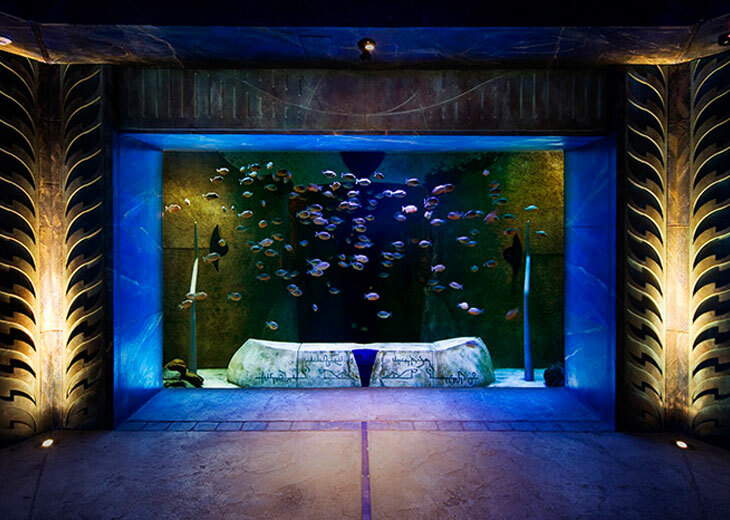 Award Winning Ossiano: A wonderful restaurant with views into the underwater world of Ambassador Lagoon Aquarium; the focus is (unsurprisingly) on seafood, and the cuisine is based on the flavours of the Mediterranean, Pacific Ocean and Indian Ocean. The food is exquisite, and the restaurant’s signature dish is El Romantico”, a majestic warm seafood platter which is perfect for sharing. Caviar, oysters, lobster, foie gras and scallops are all on the menu. You can choose to dine a la carte or to try the Especial Chef menu, which changes daily and costs AED 395 (£67) per person, or AED 595 (£100) per person including specially paired wines. Ossiano also offers a champagne and caviar package. Nobu: The world famous Japanese restaurant comes to Dubai – contemporary cuisine and Arabian influences make a stunning dining experience. The space also includes a sushi bar and a sake lounge, and sometimes you can even participate in sushi classes. Rostang: Classic French cuisine in a modern setting, dining at Rostang is elegant, charming and extremely exciting. With classics such as ‘moules frites’ (mussels and fries) and French roast chicken on offer, it’s no surprise this restaurant is one you need to book early! Ronda Locatelli: A warm, rustic Italian experience, where flavours range from bold and strong to subtle and delightful. The wood burning pizza offers a fun dining experience which kids love – and the menu is also very child friendly. Special Occasions Seafire Steakhouse: A New York style grill and steakhouse, with a huge range of steaks on the menu. Meat is grilled over wooden chips which impart smoky flavours, whilst fish and vegetarian options are also available. Two courses at Seafire Steakhouse currently starts at AED 215 (£36) per person. Levantine: with a show kitchen that all diners can view, this authentic Lebanese restaurant is elegant a decorative – much like the food! In the evenings, the restaurant also hosts a dance entertainer and an adjoining terrace. The seafood and meat grills are particularly well reviewed! Nasimi Beach: A place to both eat and party, Nasimi Beach offers a range of meals from seafood to pasta – and the infamous Nasimi Burger made from 100% Wagyu beef! The restaurant opens onto a pristine white beach and an outdoor terrace is the place to party once your meal is done. 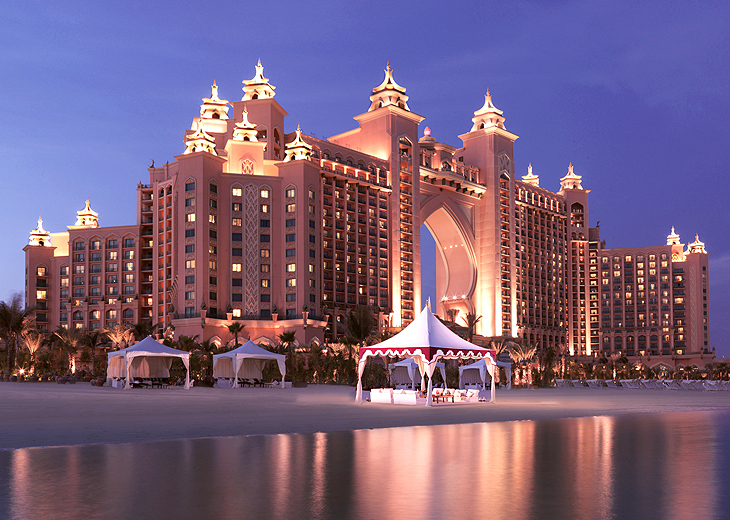 Atlantis the Palm also has a range of bars across the hotel for a relaxing drink, whatever the time of day. Dubai is served by Dubai International Airport, which is around 5 kilometres from downtown Dubai – transport from the airport can take between 10 and 45 minutes. Public transport can be sporadic, but local taxis are copious and safe. Dubai is a brilliant place for shopping – it’s a ‘duty-free’ zone, so a great place to stock up on designer goods – just remember you’ll have to declare purchases at Customs on your return! The hotel operates a welcome and assistance kiosk at Dubai International Airport – allowing travellers to check in as soon as they land in Dubai and start exploring the hotel the moment they arrive! It’s situated in the arrival hall of Terminal 2 and 3. Guests who check into the hotel before their rooms are ready can use the facilities of the Hospitality Lounge – a place to relax in air-conditioned surroundings and enjoy a drink whilst your room is prepared. For travellers who want to get the very most out of their Atlantis experience, the Imperial Club is a ‘resort within a resort’ which offers elegant private areas, select dining options and complimentary business and internet facilities. The Atlantis hotel in Dubai aims to ensure that all guests enjoy the best possible experience – which means that most of the hotel is non-smoking. However, some rooms are designated smoking rooms and there are poolside smoking sections. There is also a smoking area in the Sanctuary nightclub. The hotel’s overall dress code is ‘smart casual’ – meaning that shorts and flip flops are only considered acceptable by the pool and in the Aquaventura areas. You may be refused entry to restaurants and other areas if you are not considered appropriately dressed. Some events set their own dress code requirements. Please remember that Dubai is a conservative country and revealing clothes will be frowned upon. A cover-up over revealing swimwear is also requested in the hotel policy. 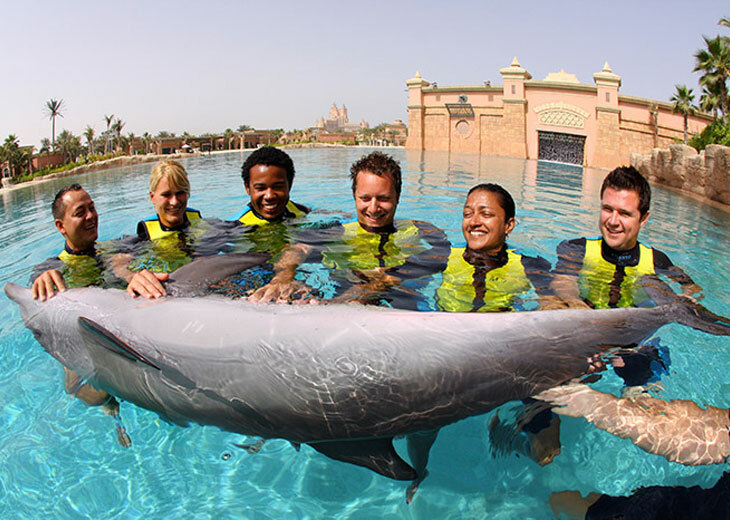 Atlantis The Palm offers a number of ways to make your stay extra special – if you know about them! 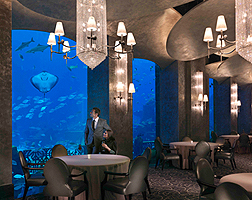 View our insider’s secrets for the Atlantis. 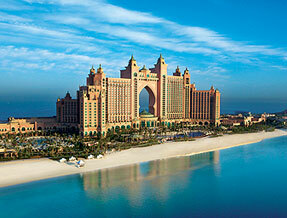 Looking for a holiday in Dubai?